The Funky Felter: A Sweet Treasury of the Needle Felting Etsy Street Team (NFEST) Member's Items by LittleElfsToyshop! 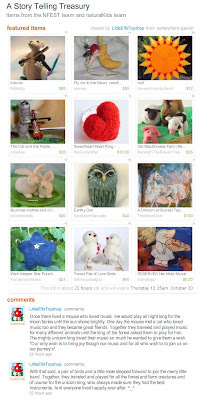 A Sweet Treasury of the Needle Felting Etsy Street Team (NFEST) Member's Items by LittleElfsToyshop! I came across this treasury on Etsy a couple of days ago and just wanted to share. It features items from the Needle Felting Etsy Street Team, or NFEST. It also has a sweet story by LittleElfsToyshop, the creator of the treasury list, at the end. I'm honored that my bright red felted heart ring was chosen to be a part of this. Please browse the list of other featured NFEST members below. If you'd like to become a member of NFEST, please visit the team's profile page on Etsy. And, for more information about the team, please visit the NFEST blog. Now go check out these great needle felters' Etsy shops . . .
this was such a lovely treasury... really inventive and the story was so sweet... was very happy to be in it! Cute items. Love this treasury! Felt is something that i don't know a lot about! thanks for sharing this treasury.